Bangalore, March 17, 2017: Agra till now was known for its unprecedented beauty, love, romance and Taj… but from 20th March onwards, it will also be known for two Dabang Dulhans – Shrishti and Ragini who will set your television screens ablaze. With a quirky family drama of two unconventional brides and one helpless groom entangled in a marital quandary, &TV launches its new fiction show – Agnifera, starting 20th March, Monday-Friday at 8.00 pm. The show that draws inspiration from the heartland of Uttar Pradesh in terms of the flavour and dialect brings together actors Ankit Gera, Yukti Kapoor and Simran Kaur in lead roles. 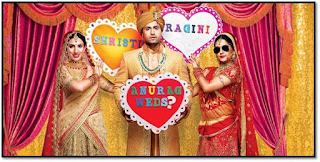 Produced by Roshan Lal & Ravi Raj Creations, the show highlights the lives of Anurag Singh (Ankit Gera), Ragini Singh (Yukti Kapoor) and Shristi Singh (Simran Kaur) as their paths cross in an unusual manner. Anurag, a highly qualified MBA graduate from London, is the most eligible bachelor in town is caught in the cross fire of two marriage proposals. His bridal candidates are the Dabang Dulhans – the daring Ragini who is known for her bandook ki goli and the virtuous Shristi who swears by kanoon ki boli. Both, courageous, brave, and strong-headed wish to become Anurag’s wife but who will end up as his bride? &TV is the flagship Hindi GEC amongst the ‘&’ bouquet of channels from Zee Entertainment Enterprises Limited (ZEEL), a global media and entertainment company. Staying true to the personification of the Ampersand, &TV signifies a conjunction of aspirations and rootedness which is synonymous with the spirit of New Age India. Through its content offering, the channel brings together people and ideologies thus fostering cohesive viewing within Indian households. &TV showcases a diverse and dynamic mix of relatable fiction, high voltage non-fiction, marquee events and blockbuster movies. The channel is available in SD and HD across all Cable and DTH platforms and enjoys a leading presence in international markets including Asia Pacific, Europe, the Middle East and Americas. The channel, viewed by premium audience is fast gaining popularity across territories. More information about &TV is available on www.ozee.com. You can keep abreast of all &TV shows on social media platforms like Twitter - @AndTVOfficial; Facebook – AndTVOfficial and Instagram – andtvofficial.